Are there certain songs, that when you hear them, have the power to bring back memories as clearly as if you were experiencing them again? Are there certain songs, that when you hear them, capture who you are in this moment? “Shining Light” by Annie Lennox is that song for me. As I strike out on a new adventure, redefining who I am, I embrace this uplifting song as my unofficial theme song. 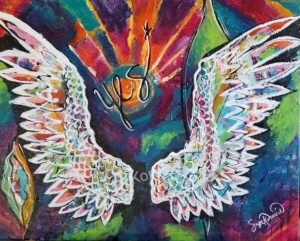 “Shining Light” is positive and empowering. “Sovereign bride of the infinite, Yeah, you are a shining light.” Wow! That fills me with confidence and the belief that anything is possible if I let my light shine. In any given moment, there are infinite possibilities available to us. Some small- “What will I have for breakfast?” Some major- “Is it time to end this relationship or time to leave this job?” How different life could be if we recognized that we are light beings, connected to all that is! I can choose to crumble under the fear, hatred, and ignorance playing out around the world (especially in politics). Or, I can choose to stand in love with all of the amazing people who make a positive difference because they let their light shine. So Annie, if you are reading this, your song captured the spirit of how I want to walk in the world. Thank you for this inspiring anthem! I’M GOING TO LET MY LIGHT SHINE!